As Jesus hangs on the cross, the chief priests and scribes are there, saying. "He said He could save others, but He cannot save Himself." FTER THE SAD, long night when Jesus was captured in the garden, morning came at last, and the news began to spread through the city streets that Jesus, the prophet from Galilee, was now a prisoner. His friends were terrified, while his enemies laughed in wicked glee. And the soldiers led him before the Roman governor, Pilate, for this governor now took the place of the King Herod who had tried to kill Jesus when he was born, in Bethlehem. He went out to them and said, "I find no fault in this man." When Pilate heard that Jesus was from Galilee, he said, "This man belongs to the country that Herod rules." This Herod was a son of the wicked king who tried to take Jesus' life when he was a baby. Pilate sent Jesus to Herod at once, for Herod was in Jerusalem at that time. Now Pilate's wife had heard about the trial of Jesus and she was greatly troubled, for that night she had dreamed about him. She sent a message to her husband, urging him to set Jesus free, saying, "He is a just man, not worthy of death." But the mob now cried, "If you set this man free you are not a friend of Caesar, and Caesar will dismiss you from being our governor." The money that he had taken from the enemies of Jesus seemed to burn his flesh, so he hurried back to the chief priests and scribes, saying, "I have sold an innocent man! I have sinned!" The chief priests and scribes looked scornfully upon Judas and replied, "What is that to us? You yourself must answer for your sin." And they turned away from him, refusing to take back the money they had given him for doing the dreadful act. Before giving Jesus up to die Pilate talked to the restless mob about another prisoner whom he held--a wicked man named Barabbas, who as a robber had caused much trouble to the Jews. And with loud cries the people answered, "Set Barabbas free!" Then Pilate asked, "What shall I do with Jesus?" They answered, "Crucify him! crucify him!" So the trial came to an end, and Pilate, wishing to please the people, called some Roman soldiers and told them to lead Jesus away to be crucified. First he took water in a basin and washed his hands before the Jews, saying, "I am not guilty of the death of this innocent man." The Jews cried out, "We ourselves will bear the blame; let his blood be on our heads!" The Roman soldiers took Jesus and put a crown of thorns upon his head. Then they put a reed in his hand, and, bowing before him, mockingly called him the king of the Jews. They also blindfolded his eyes, and spat upon him, and struck him with their hands, saying, "Tell us, prophet, who is it who struck you?" On the hillside of Calvary the crowd stopped, and the soldiers began to strip their prisoners of their clothing and to fasten their hands and their feet to the crosses. Then they raised the crosses high in the air and planted them securely in the ground, leaving the prisoners to hang there till death should relieve them of their misery. 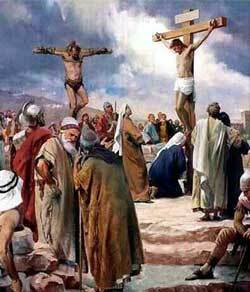 Jesus prayed when they were crucifying him and said, "Father, forgive them, for they know not what they do." The cross on which Jesus was crucified stood between the two crosses on which the thieves were hung, and a writing was nailed above the head of Jesus, which said in three languages, "This is Jesus, the King of the Jews." When the Jews read the writing they were much displeased and hurried to ask Pilate to change it, that it might read thus: "He called himself the King of the Jews." And Jesus saw his faith, and said to him, "Today you shall be with me in paradise." Even the chief priests and the scribes were there, and they said, "He said he could save others, but he can not save himself! If he is the king of Israel, let him come down, and we will believe in him, too." About noonday the sky suddenly grew dark. For three hours the great darkness lasted, then Jesus cried with a loud voice, saying, "It is finished!" and soon he died. And the captain said to his soldiers, "Truly this man was the Son of God!"